We love the Gruffalo. He has been a feature of story time in our house for years now, since my youngest was only a toddler. Our copy of the original Gruffalo book is well book eared now from endless use. We moved on to Gruffalo colouring books, jigsaw and DVDs. As you might have seen my kids love a go on our iPads. Whenever there is news of a new app their little ears prick up. When I was contacted about the new Gruffalo: Games app I was instantly drawn in. As were my kids. 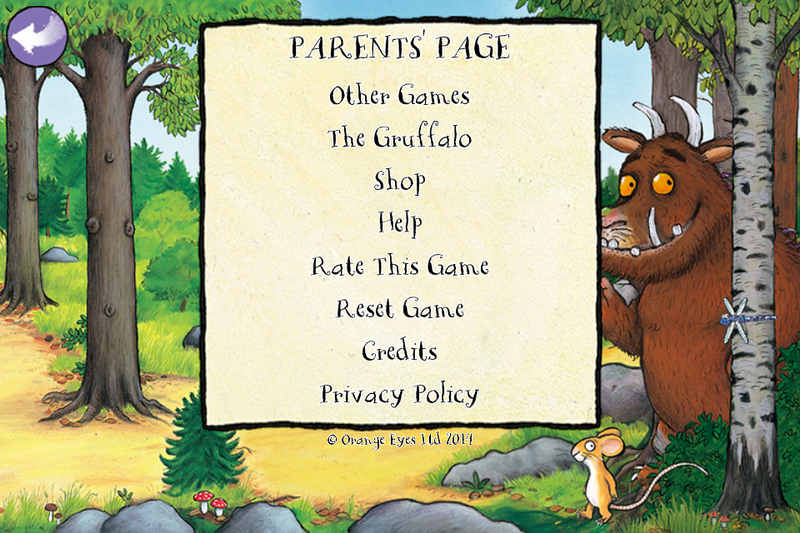 On logging in to the Gruffalo: Games app there is the lovely Gruffalo music score anyone who has seen the film will be familiar with and visually there is a beautifully animated menu screen. The attention to detail is incredible, with butterflies and dragon flies moving gracefully across the screen and the Gruffalo himself blinking as he waits for you to select one of six games. The six games include some old familiars such as 3 in a row, snap and match me. A click of your chosen game and a little bug will march across the screen as your game loads. Just more lovely attention to detail. 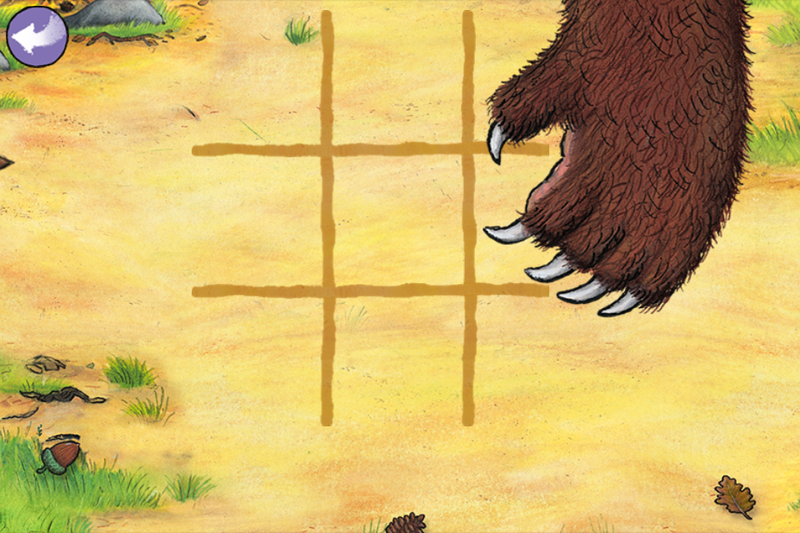 In two of the games (3 in a row and snap) the child plays against the Gruffalo himself. 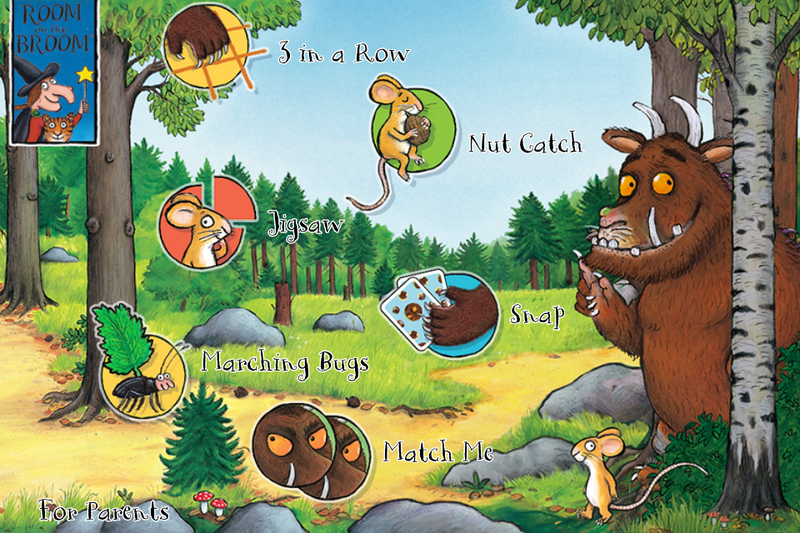 I loved how the Gruffalo got out his big terrible claws to create the lines for the 3 in a row game! With three kids in my house, all within the games target age range of 3-7, they all wanted a go. As they are so adept at using an iPad or iPhone they were quickly straight into the games. My 3-year-old loved the Match Me game and Snap was a real favourite. So much fun to play against the Gruffalo, I even snuck in a few games myself. What is also lovely is that the games not only feature the Gruffalo himself but other characters are included too such as mouse, owl and snake for example on the snap cards, in match me and on the jigsaw. 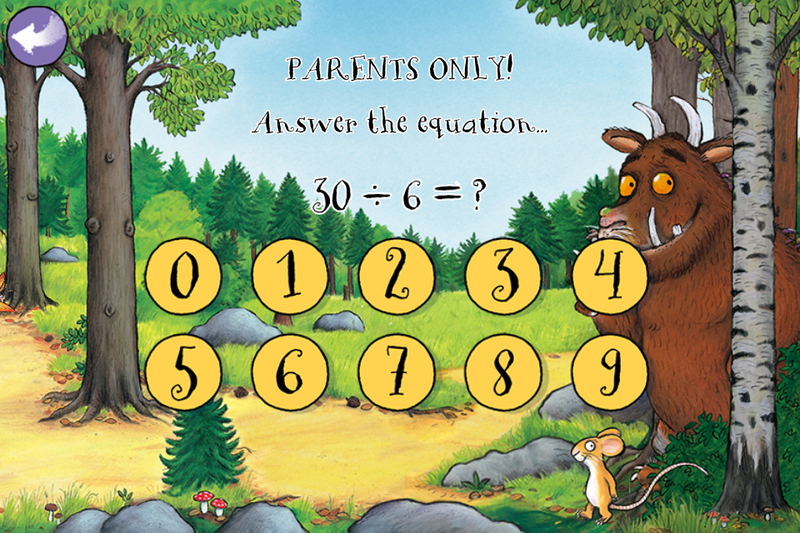 There is a parents page (protected from curious kids with division sums that would be exceptionally difficult for any child in the age range to complete unless they are a child genius) which includes access to information about Gruffalo, the ability to download the film and a link to the online store. 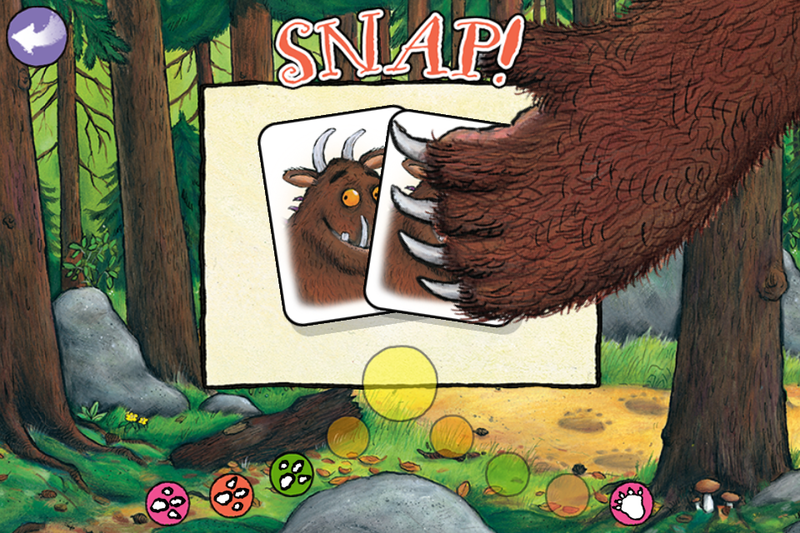 As if one great Gruffalo app wasn’t enough, while trying out the games app I was asked if I wanted to give their second app a try – Gruffalo: Photo which was also developed by Magic Light Games. In case anyone thinks that apps mean that kids are stuck in doors then think again. 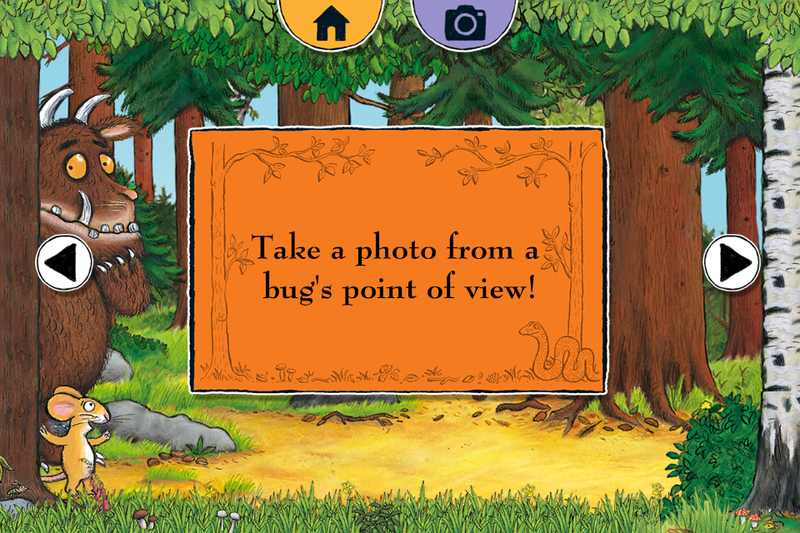 This app is designed to work with the phone’s camera and creates a lovely forest scene to use while out and about. So one to take along on a nature walk or when out and about in a park. The camera frame is relatively simple (although there is a choice of frames) but the app allows you to put little stickers and phrases on the photo and save the photo in a scrap-book. In addition there are some “things to do” so you won’t be stuck for inspiration while out on a walk. Keep the kids busy for hours completing the tasks such as taking a photo from a bug’s point of view, hunting for animal footprints, take a photo of the smallest / biggest thing you can find, take a photo of a shadow. 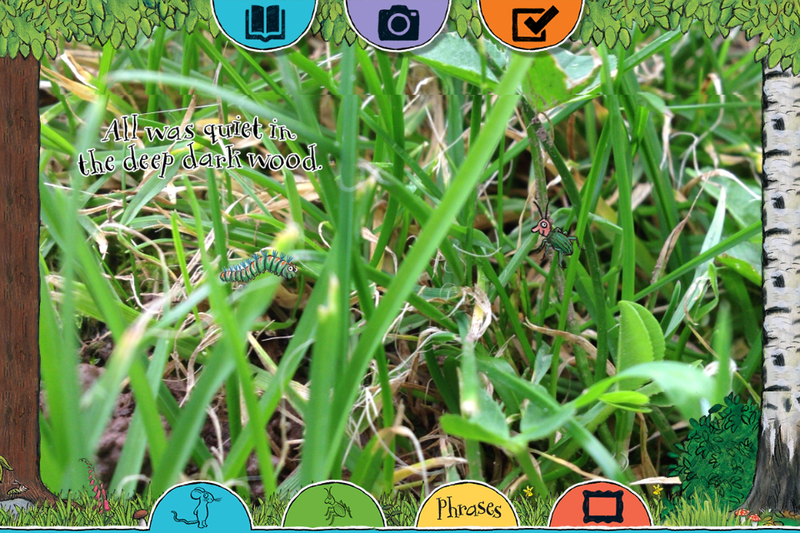 Here is our attempt at taking a photo from a bug’s view with added stickers and phrase! Overall, the kids weren’t as excited by this app but it was a nice little app nonetheless. While we are heading into winter, if we can get some dry bright days, we hope to get out and about and use this app some more for a bit of fun. This app is also available to download from the app store, and as it is a simpler app than the games one, it is at the cheaper price of €1.79.